Juniper, Gin & Lemon - this Great Taste award winner is a 'grown-up' shortbread with sweet juniper berry combined with zesty lemon and a splash of Bombay Sapphire Gin. Almond & Amaretto - almond flakes combined with a dash of Amaretto for added indulgence. Perfect with a tea or coffee. Cherry, Peppercorn & Kirsch - a delicate combination of sweet and spicy with peppercorn and sour cherries, plus a hint of Kirsch. 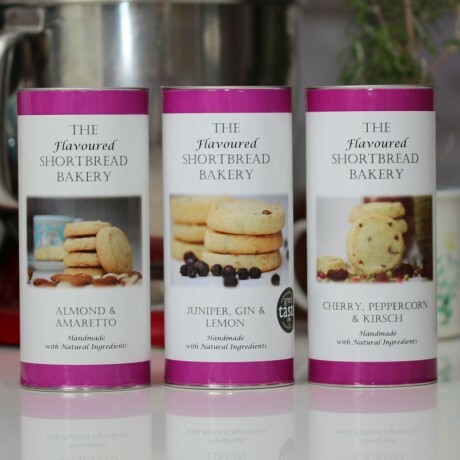 These delicious shortbreads are made entirely by hand to a traditional recipe, with only natural ingredients. Available in 3 tubes each containing 8 shortbread rounds. 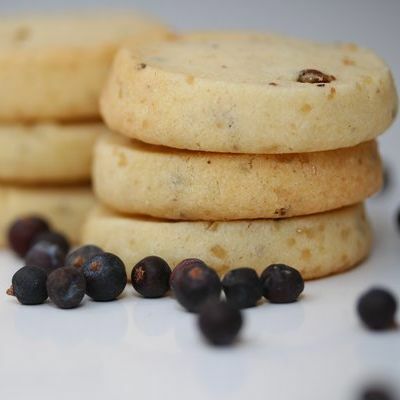 Juniper, Gin & Lemon: Wheat Flour, Butter (unsalted) (Milk), Sugar, Juniper Berries (1%), Lemon zest (1%), Gin 47% vol (< 1%). Almond & Amaretto: Wheat Flour, Butter (unsalted) (Milk), Sugar, Almonds (Nuts) (6%), Almond Extract, Amaretto Liquor 40% vol (<1%). 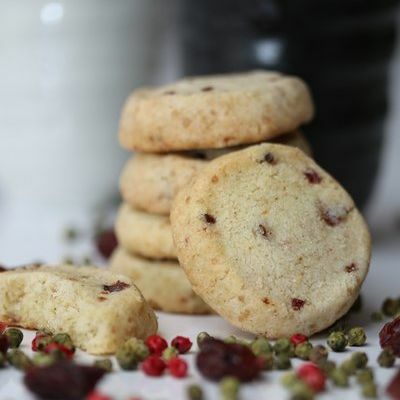 Cherry, Peppercorn & Kirsch: Wheat Flour, Butter (unsalted) (Milk), Sugar, Cherries (10%), Green Peppercorn (1%), Red Peppercorn (1%), Lemon zest (< 1%), Kirsch 40% vol (< 1%). Allergens shown in bold. Made in a kitchen which handles nuts (almonds, pecan, pistachio and walnuts). Gourmet shortbread rounds with unique flavour combinations.